In 1971, during a time of turmoil and tension due to the recent decision to desegregate schools, the Jigsaw strategy was first put into action. Professor Aronson and his graduate students invented this strategy because of the particularly hostile environment within the school. Desperate, the principal came to Aronson and asked him if there was anything that could help this situation. Through careful observation, he came to the conclusion that the hostility was because of the fierce competitiveness between the students. To Professor Aronson, it was obvious that the classroom needed to become more of a cooperative learning environment instead of a competitive environment (Aronson, 2012). 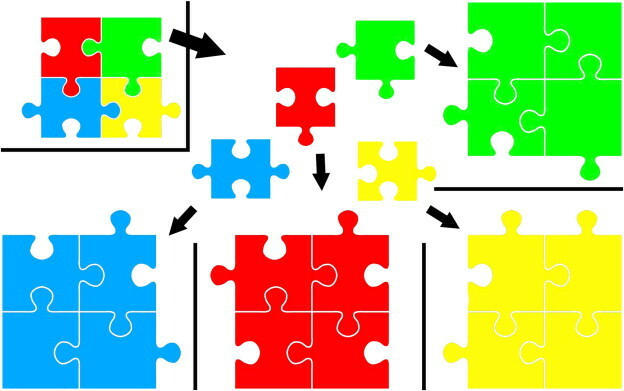 The Jigsaw strategy is considered to be cooperative learning. There are four typical elements that are found in cooperative learning. They are: positive interdependence, individual accountability, promotive and face-to-face interaction, and development of social skills. This strategy was created specifically for this type of learning. It encourages interdependence while still requiring each student to be held accountable for their actions (Weidman & Bishop, 2009). The first to test the Jigsaw strategy was a fifth grade classroom. It was not introduced to the entire school so that the faculty could accurately gauge its effectiveness. It was a comparison of the Jigsaw classroom versus the traditional classroom. This allowed it to be more scientific and allow for more objectivity. The total process was completed in eight weeks (Aronson, 2012). The first Jigsaw strategy focused on the life of Eleanor Roosevelt. The students were divided into small groups by their ethnicity and gender. Each student was responsible for a part of Roosevelt’s biography. The actual classroom was restructured to allow for this strategy. The students worked in small groups. At first, it was still stressful and students employing the same competitive tactics that were previously used. However, with time, this died down because they realized they had to work together in order to achieve the desired grade. They could no longer undermine the other students. Instead, they had to help each other out and draw out the answers. After only a week or two, the school atmosphere changed from that of anger to cooperation. Absenteeism declined and school became more exciting (Aronson, 2012). In order to create a Jigsaw, the students should be divided into five or six person groups, also known as “home groups” (Fisher & Frey, 2012). They should be diverse. This could mean that the students are different genders, ethnicities, races, and have different abilities. Each person in the group should have a role. There must also be a leader appointed in the group. It should be someone that can handle that role and be mature enough to complete his or her responsibilities (Aronson, 2012). Once the groups are divided, divide the lesson into five or six segments. Assign each student one segment. They should only have direct access to that one segment. Give the students time to review their sections and familiarize themselves with the details. Once this is completed, the students can break into “expert groups” depending upon their topic (Fisher & Frey, 2012). They will then be given time to discuss the main points of their segment and create presentations about that topic. Students should also take notes during this time so that they may have information to refer to when back in their home groups. Once completed, the students return to their home groups and present their findings. The students are allowed to ask questions on anything that may need clarification (Aronson, 2012). During this process, the role of the teacher is to act as an observer. He or she will walk around the room observing what the students do and how they participate. Also, if needed, the teacher may step in to get a group back on track or reinstate the roles within the group. At the end of the Jigsaw, the teacher should give a quiz so that the students realize that this is not a time to goof off or to just socialize. Instead they will realize that it is worth a grade and they should focus on their particular segments as well as listen to the presentations given by the other students in their group (Aronson, 2012).